You almost never want your developers talking directly to customers. Almost nobody is happy after the meetings/discussions (customers, sales, marketing, engineers, support). But I have seen million dollar computer systems replaced because tech pubs refused to document an alarm bypass switch. Engineers used to debug system. Field service saw system going into panic shutdown because the system would not stay up long enough for them to diagnose a bad connector. Tech publication thought that switch was "dangerous" or confusing. Agree, but sometimes there's forums they "lurk" if the company doesn't have it's own. I've never expected to talk directly to developers at SE, however I do expect that if a true and know bug in the firmware is found that it be fixed and released in a very timely fashion. Case in point with the 80/600 charge controller. The specs and manual specifically state support for 16~67V, however the unit actually gives a warring at 63V and hard faults out and shuts down at 64V. I don't think this type of problem should be ignored for as long as it has been. The available firmware is still the original release and has not been updated since first product release. I don't believe it would take more than a few hours to simply change the warning/fault voltage setting in the firmware from 63/64 to 67/68 and release the fix. SE tech support has confirmed they have duplicated the issue, and have submitted a 'known bug' report to engineering, all further contact with SE support on this issue has resulted with the same answer "Issue has been submitted to engineering with no ETA on when or even if the issue will corrected. I could list in detail more than a dozen such issues all of which have been completely ignored by SE. I will eventually replace all my SE equipment with Outback and will end up selling the SE equipment on eBay/Craig's List. I cannot and will not EVER recommend anyone to purchase SE equipment. I'm only one person and SE more than likely doesn't care in the slightest about my opinions, comments and problems, they have my money and could care less. I was lucky. I had worked in the field repairing equipment. And when starting a new design, a small group of us got to tour several telephone central offices and ask what they need for computer equipment for service and such. We really enjoyed talking with end users. But you have to be careful too. The customer does not always know what is best either. Words of wisdom! This should probably been installed by someone with direct experience. The customer may not know what is involved and that is why field support folks with their access into Schneider would not have had this go on for so long. This really is an advanced installation and not do-it yourself. The equipment works quite well when configured correctly. This is the second time you have alluded to the fact that this system was a "DIY advanced install" and the equipment works quite well when "configured correctly"
What I would like to understand is what you consider an "advanced install"? Would it be installing PV modules? Would it be mounting Inverters/CC on the wall? Would it be following a wiring schematic? Would it be the configuration of each piece? Would it be finding and reporting "known and confirmed" firmware bugs? At what point does a standard install capable of DIY install become something so advanced as to require "special field support folks"? My system was designed, blueprinted and permited by an electrical engineer. PV array and equipment installed by SE authorized sales and support company. Electrical wiring and panels installed by state licensed master electrician. It was inspected by local code enforcement and by the utility company PV installation inspectors. After all the issues and bugs in software started coming up, SE Solar tech support was given remote access (they still have remote access now) for making sure all was "configured correctly". Would you then say that even SE support is incapable of "configuring correctly"? I just agree with what Mike said below. If there is a problem with this new XW 6848 in grid tie your installer should know how to escalate this to the point of getting your money back. I just know that it works great offgrid. You also said something about the XW-80-600v charger that I think you are confused about. The output can go to the max spec on the solar charger. I did beta testing on it for Schneider, it works great. What many people forget is the XW inv/chg has configurable settings under the advanced settings in high battery cut-out. If they are not at max then you will get warnings during an EQ if you are too close. You might be at default values. Again whatever is going on really should be for the installer. Too many cooks in the kitchen can cause a large company too just back-burner problems that are not really of their making. I asked my Rep at Soligent who supplies me and thousands of folks if there were any issues with the + series. He said no. There may be issues with load balancing between phases. If too much load is on one phase (3Kw per each leg) that may be what's triggering the slave. You can use the combox to verify the different loading between legs, and that your loads are indeed split evenly. Installer may have crossed a wire somewhere. You also said something about the XW-80-600v charger that I think you are confused about. The output can go to the max spec on the solar charger. I did beta testing on it for Schneider, it works great. I dislike to call out anyone but in this regard you are completely wrong. You can test this for yourself very easily. In the 80/600 simply set the Bulk/Absorb voltage to 63V and wait for the W34 DC Output Over Voltage Warning warring from the CC. The warning/fault is coming from the 80/600 CC and has nothing to do with the settings in the inverter. You can also confirm the warning and fault using the XW by setting the bulk/absorb voltages in the inverter and using the inverter to charge the batteries while leaving the 80/600 online. Further issue in the 80/600 CC is voltage temp compensation, when using the supplied BTS connected to the CC as the temp falls below 25c the voltage should increase according to the Battery Temp Compensation setting (default = -108mV/C). However as the temp falls so does the voltage, operating exactly opposite of the way it should. If you were involved in the beta testing for SE then either you missed the boat on this one or SE engineering made changes to the firmware after your beta testing. You should take steps to confirm for yourself and then see if you are more successful than we have been in getting SE to fix the issue. SE tech support on 2 occasions confirmed they easily duplicate this issue and have confirmed they have asked engineering to look into it. Read what I said again please. The Inverter menu needs to be changed to track the the CC. The inverter will generate faults if it is supplied with higher DC than its cut-out setting! In any case you need your installer to be dealing with this! I am so lucky that I do not have to deal with the grid! In the 80/600 simply set the Bulk/Absorb voltage to 63V and wait for the High DC Voltage warring from the CC. The XW inverter is not giving the warnings/faults, the XW high dc cutout is set at factory default of 70V. 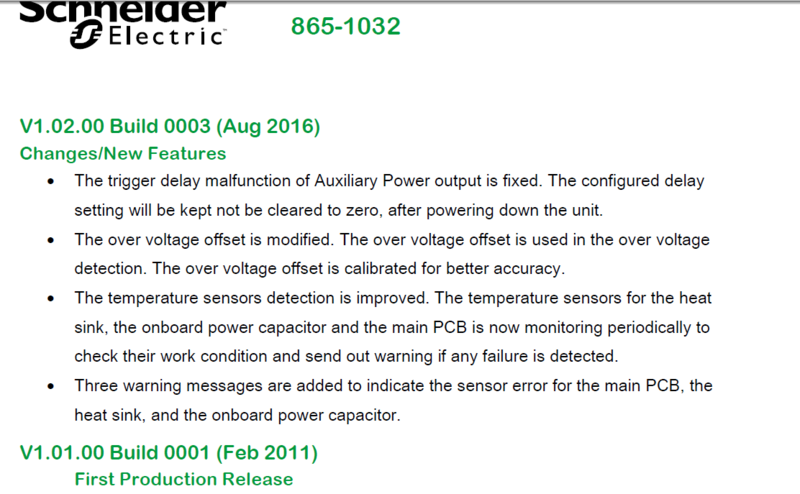 The 80/600 Charge Controller is giving the warnings/faults. The spec's on the Charge Controller list 16~67V. The installer has on several occasions setup the system configurations to run strictly "off grid" while some of the issues related to the grid with the XW go away some remain. It dose not matter if the system is on or off grid, the CC will still produce the same voltage warnings/faults in either case. My installer has been trying unsuccessfully to deal with SE on all the issues of which the 80/600 CC is one of them. Bottom line is that SE has many issues and bugs throughout the system and can't or won't address them. All I ask of SE is to provide me with a system that works as the manual says it should and within the spec's they provided at time of purchase. Nothing more nothing less. there was a software revision that allows load shave amps to be able to be reduced to 0 A. Is there a way to find out what version of the software is currently being used? My system is the new XW+ and the firmware in on the http://solar.schneider-electric.com/ website. I don't know if its the same firmware for the older XW version or not. If you send an email with your model number, question and request for latest firmware to [email protected] they usually respond within a day or 2 with the info and usually a download link for the files needed. You can get the latest firmware, but don't you need their special dongle thing to install it? I've wanted to upgrade my XW MPPT-60-150 charge controllers for awhile, since I hate how they're on and off, on and off if I don't have the breaker to the PV panels turned off in the morning, especially on cloudy days. Also, what I've been told by the Schneider people is that putting the XW6048 into standby mode is not a good idea, that there is a problem with that. I don't know what problem that is, maybe somebody here knows, but so far I haven't been brave enough to try to see what happens. On mine, the On/Off switch no longer works, which I'm not so happy about since it's been used only a few times in the years I've had it. And finally, is the problem that reefbum is having somehow related to the dreaded Fault 49 thread awhile back? This is just a wild guess though. I checked with my contact at Schneider and gave him a link to this thread. I also checked a clients XW+ with the Mppt-80-600V controller and he is doing EQ's at 64VDC without any errors, faults or warnings. It just seems like this has gone on for too long. Please have your client with the 80/600 set the bulk/absob voltage to 64V and see what happens. Also if your client uses the XW+ to do the EQ at 64V from grid or gen (i.e. low light where CC is not producing enough for EQ) the CC will give warning as soon as the voltage reaches 63V and fault at 64V. We do this all the time when the weather is bad and an EQ is needed in a system with multiple solar cc's. Because only one charger can EQ, I have my clients, charge the battery, then set bulk absorb to the EQ voltage, force a charge, set a timer, remember to set bulk absorb to correct values. It is great for running large loads, with multiple cc's while running EQ. Do you have a COMBOX to configure settings, or just a SCP ? If you have a COMBOX you can use it to upgrade firmware of all the XW gear, no Implanter needed. I'm not sure what the dreaded standby mode is, I have mine powered up 24/7 for my house. Guys, this was from 1.5 years ago. The OP in all likelihood will never come back on this one. They rarely do INMHO. Actually I do come around quite a bit, I just don't post anymore about the garbage Schneider sells..
You may be a Fan Boy or an employee for all I know or care. I got rid of all the Schneider equipment, replaced it with Outback equipment which solved all my issues. I still stand by my original feeling that if you want a system that works don't buy the crap Schneider sells. I found this post while researching whether to go with the SE XW+ 6848 vs Outback Radian 8048A inverter. I was strongly leaning towards the SE XW+ product given the features I have seen on paper. Having read the comments here, looks like I may strongly reconsider my future choice. I love to tinker and experiment, and given the fact that SE does not provide firmware updates for bugs, and that advanced features do not work is a deal breaker. I am planning my own system out, and it would not be "typical" installation, but something more unique and "not" standard. So the question is, have the bugs reported above been solved or are things status quo? I can't say if any/all the issues have been solved as I'm now running Outback equipment, however I just checked the SE website and the firmware for the 80/600 charge controller is still the same release from when I did have the equipment so I would "guess" that the issues at least with the charge controller remain. SE needs to do a better job of documenting how all the software controls work, and how settings should be done, Glossing over automatic 20% back-off here and there can really trip up someone wondering why the genset won't load up, They parcel out the info one cryptic email at a time. And Chris is the source for how to do it. This thread seems rather older, but concerning. Are these issues fixed 2 years later? They will not be fixed if you have equipment that has not had the firmware updated. That goes for equipment in stock that was manufactured before fall 2016. If you buy from the store here (or me), the equipment is drop shipped from Schneider Electric Solar and is up to date. Very few people had this issue as these voltages are beyond what normal battery systems use. In fact, the trend with Li-Ion is lower and safer voltages. What do you think the problem was? It probably does not pertain to the voltage your battery uses for charging. Voltage Limit” to 68V to accommodate NiFe batteries. they can e-mail me below. Most of the 10's of thousands of XW systems are working fine without these very high 48V nominal voltages. I'm not the most knowledgeable person here but I've been running a self installed grid tied Schneider inverter, controller, PDP, battery monitor, and SCP for 2 years with good results. Getting the controller working did have a few challenges and learning the best inverter settings took some trial and error but overall I'm happy that I chose Conext equipment. Other manufactures are probably also very good but I know that my Conext equipment is good. Regarding the problems with the controller install (bad unit) my Schneider tech support was satisfactory and they were fast in providing the help I needed. But.... I've never had any need to set the charger voltages over 62.3v (strong EQ) and don't see where I'd ever need to set them over 64 as the OP seems to be doing or even 63 which sounds like it may set off an overvoltage alarm according to some posts on this thread.